Batman: Arkham Origins Dev Met "Resistance" at "Every Level"
Ben Mattes, senior producer for Batman: Arkham Origins, says the development team worried that it had "bitten off more than [it could] chew." 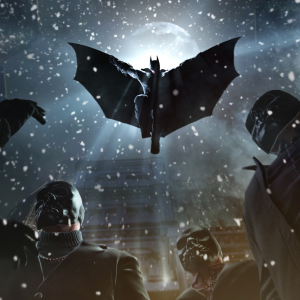 Batman: Arkham Origins has launched and, for the most part, has been receiving positive reviews. This will likely come as a relief to the game's development team at Warner Bros. Montreal, which apparently had a bit of a rocky time making the game. According to Ben Mattes, senior producer for Arkham Origins, "resistance and reluctance [existed] at every level," often leaving the studio itself wondering if it was up to the job. Not unexpectedly, the biggest response came from fans of the previous Arkham games. "There were fans who said: 'They're not Rocksteady, they can't make an Arkham, game,'" said Mattes. Unfortunately, these doubts didn't stop with the series' fanbase, there was "hesitation" from within the company as well. "There were concerns within the organization that we weren't going to be able to deliver the special sauce of a Rocksteady game." These worries sometimes led to doubts among the developers themselves that perhaps they were in over their heads. "There were concerns within our team, like - 'Maybe we've bitten off more than we can chew? Are we sure we're able to dance with these guys? Do we deserve to be in this same hallowed ground?'" Despite these worries The Warner Bros. Monrteal team found enough confidence to press forward into Arkham Origins' development. "We wouldn't have continued through the years if we didn't feel we had a shot," said Mattes. "I'm really proud of what we've done."